Abstract : Object tracking is an ubiquitous problem that appears in many applications such as remote sensing, audio processing, computer vision, human-machine interfaces, human-robot interaction, etc. 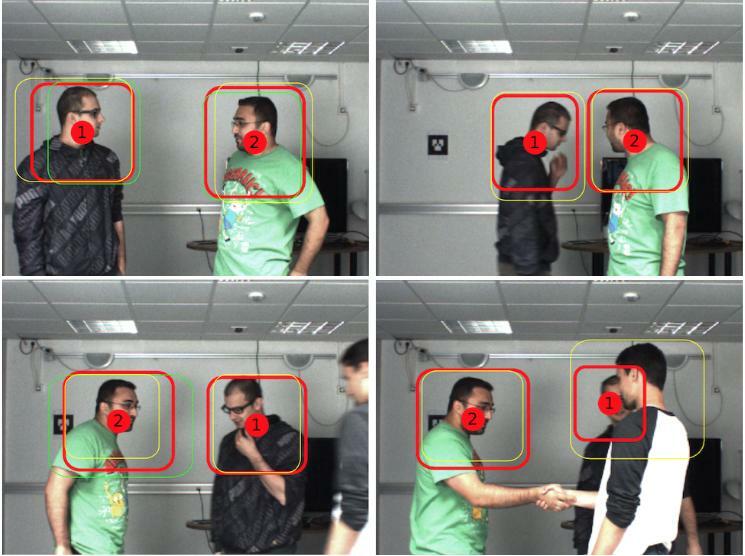 Although thoroughly investigated in computer vision, tracking a time-varying number of persons remains a challenging open problem. In this paper, we propose an on-line variational Bayesian model for multi-person tracking from cluttered visual observations provided by person detectors. The paper has the following contributions. We propose a variational Bayesian framework for tracking an unknown and varying number of persons. Our model results in a variational expectation-maximization (VEM) algorithm with closed-form expressions both for the posterior distributions of the latent variables and for the estimation of the model parameters. The proposed model exploits observations from multiple detectors, and it is therefore multimodal by nature. Finally, we propose to embed both object-birth and object-visibility processes in an effort to robustly handle temporal appearances and disappearances. Evaluated on classical multiple person tracking datasets, our method shows competitive results with respect to state-of-the-art multiple-object tracking algorithms, such as the probability hypothesis density (PHD) filter, among others.